The Kalimba (Thumb piano) is an African instrument consisting of metal tongues attached to a wooden board which are plucked with the thumbs causing metal rings on the board to 'buzz'. The wooden board is mounted on a gourd as sound box this gourd being carved and decorated with an African hut and landscape view in the continent map shape. 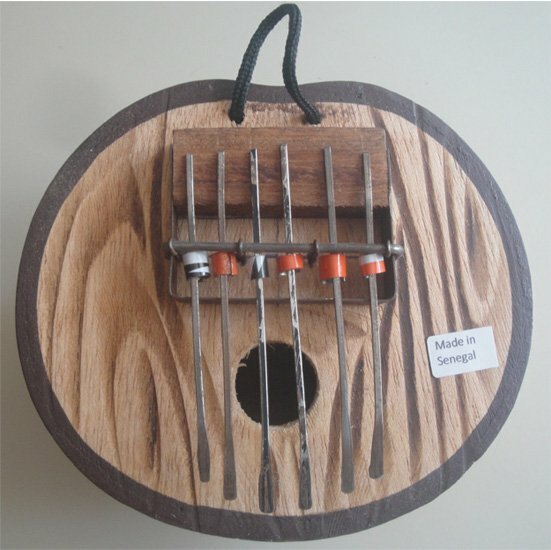 Learn how to play the Kalimba on YouTube (http://www.youtube.com/watch?v=Br6Wveirppk). Approximately 6" in diameter and 4" high. This small Kalimba features six tongues and a cord loop to carry it.